The Gundersen Health System (GHS), based in La Crosse, Wisconsin, serves patients located throughout western Wisconsin, northeastern Iowa and southeastern Minnesota. The health care system has regional centers in West Union, Iowa; Whitehall, Wisconsin; Hillsboro, Wisconsin; Friendship, Wisconsin and Boscobel, Wisconsin along with 25 other locations. Healthgrades chose Gundersen as one of “America’s 50 Best Hospitals” in 2017. The main hospital is also a teaching hospital and is designated as the Western Academic Campus for the University of Wisconsin School of Medicine and Public Health. 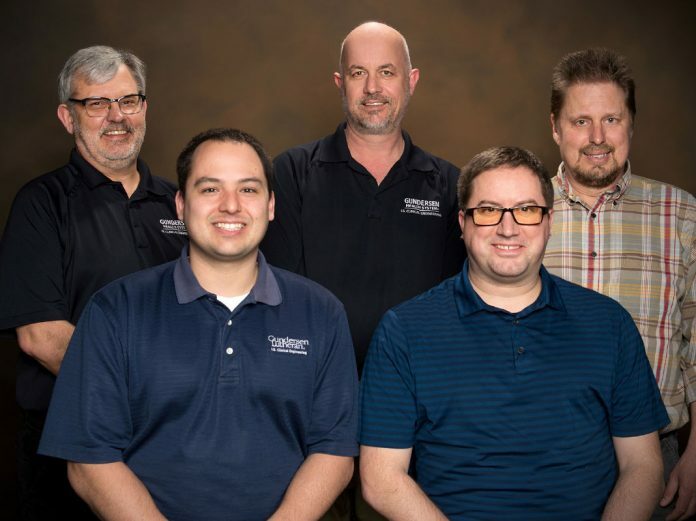 Behind the public-facing presence of this health system is a group of imaging professionals who maintain the equipment that helps Gundersen clinicians diagnose patients. “The Gundersen Health System Clinical Engineering Department consists of 18 staff and one manager. Our department is specific to a Clinical Engineering scope, however we are part of the Information Systems (IS) division of GHS, specifically in the customer and technical service subdivision,” says Ryan Motl, manager of IS Clinical Engineering at Gundersen Health System. “Of these 18 staff, five are dedicated to imaging and therapy modalities specifically, and although they have specific job titles, they are a full part of the CE program,” he says. The imaging team handles a wide range of equipment, which they are the primary servicers on. “This includes X-ray, fluoro, portables, mammography and bone density; CR & DR acquisition systems; ultrasounds; interventional systems; CT, PET, and SPECT/NM; and LINACs and ancillary software, hardware and workstations,” Motl says. When it comes to ongoing training, Motl says that helping staff develop mastery of their work is an ongoing challenge. “As you may find in many in-house departments, the ‘full-array’ of options are used at GHS to maintain skills. We use a variety of educational sources including OEM, non-OEM (both on-site and off-site), internal cross training, and on-the-job training,” he says. “Service methods and options are usually determined as part of the cost of ownership analysis when a device is being considered for purchase, and if we choose to service in-house, training costs are rolled into that analysis. This helps make sure that when purchasing decisions are made, training (both service and end-user) it is not an afterthought to be worked out later,” Motl adds. Motl says that the imaging team has oversight of, or direct responsibility for, three MRI, six CTs, seven interventional labs, three LINACs, three SPECT, one PET, 10 DR systems, six DR mammo, several portables, C-arms, ultrasounds and other equipment at the main La Crosse/Onalaska campuses. “In addition to that, members are often on the road supporting our 20 regional family practice clinics that have basic imaging — rad rooms, CR, ultrasound and occasional mammo. GHS also provides mobile mammo and bone dens to these regional sites that don’t have their own services. As we have grown, new critical access hospitals have joined the GHS family, and each bring an imaging center for which we provide differing types of support,” Motl says. Problem solving and specialized knowledge are traits of the imaging group’s team members. “As a growing health system, GHS is engaged in new facility construction and renovation quite frequently. Most of the install/de-install ‘project’ work for the imaging group stems from this, or replacement cycle activity. Case in point; we are just beginning the months-long process of replacing an older LINAC with a new system,” Motl says. “In this process, Alan Engstler has been working hand-in-hand with the department leaders, physicists, construction engineering and Varian. He is a central figure in the process of making sure that all of these stakeholders are aligned to the needs of a successful medical equipment implementation,” Motl adds. He says that there are other projects that are not directly related to install/de-install. “Matt Miller has been our primary imaging resource for a medical device security project currently underway, assisting with port, IP and destination mapping for firewall activities. Mike Starch has recently finished a long project partnering with diagnostic radiology to help automate the capture of re-take data from our dozens of Fuji CR workstations scattered throughout the tri-state region,” Motl says. Motl says that the imaging staff are familiar faces in the departments that they work with, and are often asked to be the problem solvers of first and last resort, and are key resources for planning activities. If no one else can figure it out, they often can, even if it is not related to imaging equipment per se. “Dave Houge is a veteran of the imaging realm, and able to take on just about any piece of complex equipment, but when advice is needed about the straight truck hauling around the mobile mammo, he is the first call they make,” Motl says. “Todd Frederick is our newest member of the group, recently promoted from the biomed team. He too shares this spirit, diving in on day two of his new job – scrounging local resources to find a power supply for a PC in a mini-C that another team member was working on. The customer was really needing this system back, and parts delivery would be the next day. He had ideas and resources from his previous position that led to a parts solution in less than a couple of hours. This type of teamwork and problem solving is par for the course, and as a result, they are often asked to help find solutions that our customers need, beyond equipment maintenance activities,” Motl adds. Maintaining a good reputation as a leading health care provider in the Midwest is made easier when all the imaging equipment is ready to serve patients. The Gundersen Health System imaging team does its part to keep that reputation intact.